My Great Aunt Peggy just turned 90 (yes 90!) and that calls for a big family celebration, actually two of them. She is a model of strength and independence, living on her own and taking care of all her needs herself. She drives, she cooks, she cleans, she shops, and does it all by herself, yet she’s always thinking about all the things she can do for everyone else. When my mom asked me if I would like to make the cake for Aunt Peggy’s birthday, I was so excited! Ideas started flooding my head, and then fear…How could I ever make a cake good enough for her? Thank goodness I found a very elegant cake idea in my trusty Cake Bible, by Rose Levy Beranbaum. 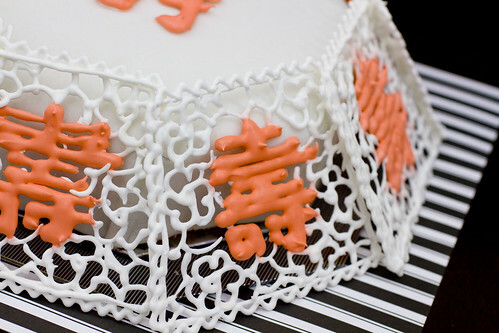 Then, I tweaked her rose trellis design into a Chinese Longevity Cake: The design focuses on the Chinese word for longevity (pronounced shou), which is commonly used for birthdays to wish your loved ones a long life of good health. 1. You can download (by clicking on) our designs below, or make your own. These should print with the sides being 8 centimeters per octagon side. 2. 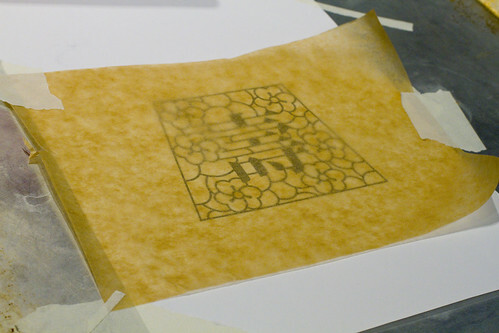 Tape the stencil down on a flat surface and tape parchment paper on top. 3. Divide 1/4 of the royal icing into another bowl. Mix in a few drops of red food coloring in to get the desired color. Fill white icing into a pastry bag with a #2 tip. Fill the pink/red icing into another pastry bag with a slightly larger tip. 4. Pipe/trace white icing on all but the longevity character. Double up around the edges. Pipe the character in red/pink. Repeat steps 1-3 until you have at least 8 panels. *It’s better to make extra in case some break. (You may notice that mine is missing one panel.) Pipe one longevity character without the rest of the panel design. Set it aside to dry for a few hours. When it’s ready, it comes off the parchment paper very easily. Do not remove too early! It will break. *Save extra royal icing in the pastry bag. Place it in a airtight container. 5. Cut out the octagon with 8 centimeter sides. Use it to cut a piece of cardboard in the same size. Cut another piece of cardboard with all sides 1 1/2″ out further (so this one is bigger). Cover the smaller cardboard octagon with foil. Cover the larger one with decorative paper. 6. Spread 1 cup of frosting on top of 1 (9″) cake. Put the other (9″) cake on top. 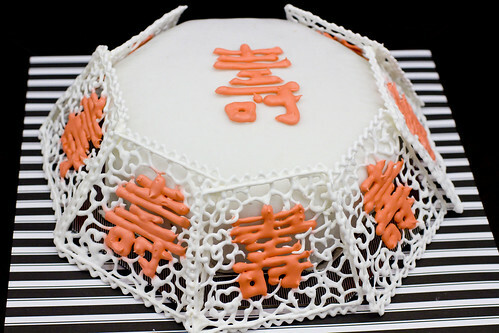 Place the paper octagon stencil right on top and use it as a guideline to cut the cake into an octagon. Bevel the top edge slightly. 7. Put a little frosting on the smaller foiled cardboard. Place cake on it. Use a very thin layer of frosting to cover the top and sides. Set aside. 8. Roll out fondant, on a lightly greased surface, to a 15″ diameter and /4″ thick. Place on the cake and carefully smooth all sides, cutting away the excess. 9. 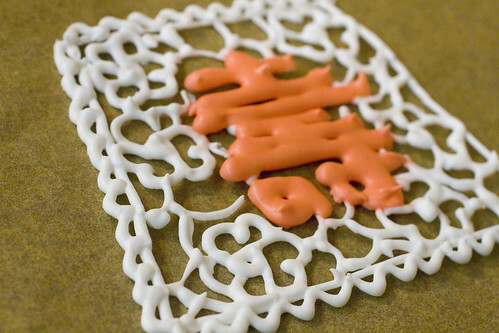 Attach the single longevity character on top in the center, by using the saved royal icing like glue. 10. Let the cake dry for at least 3 hours. 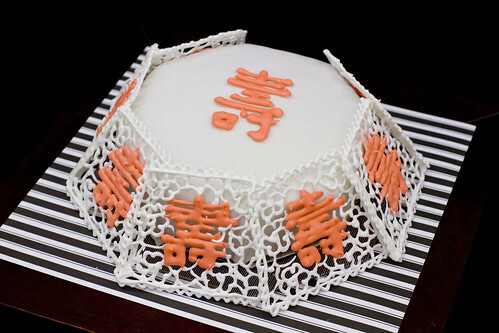 Attach the cake to the larger cardboard octagon with tape, making sure it is centered. 11. When ready to serve, attach the panels to each other or the cake with royal icing. I don’t do this until the cake is going to stay somewhere. Don’t move it after the panels are attached. posted by jessica	at 10:58 AM	Filed under Desserts, Recipes. You can follow any responses to this entry through the RSS 2.0 feed. Both comments and pings are currently closed. Such a great idea, thanks for the tip! The cake is beautiful. 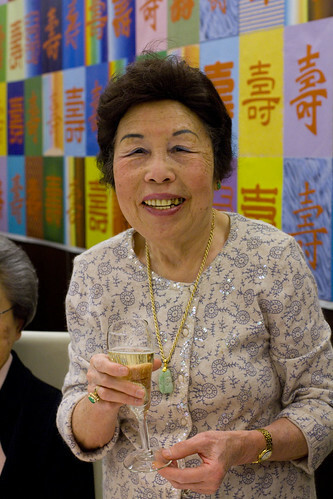 Happy bday to your great aunt! THat is really gorgeous! I love the panels… like lace trellis… and your aunty peggy has the key to the fountain of youth… well done! Wow! This cake looks fantastic! Happy birthday to your grandmother! She looks great. What a gorgeous cake! Happy Birthday to your Aunt. She doesn’t look 90! I’m not sure how 90 looks, but she is amazing! So happy and spry. Kalyan, that is Great Aunt Peggy. wow!! vat a great idea!1 m loving that pretty cake!! i am profoundly impressed by what you did with my design of the rose trellis. it is awesome. i will post it on my blog with a link to your original posting. Gosh, that is really a lovely cake! Happy birthday to your Aunt Peggy! This cake is far and away the most beautiful thing I have seen on your blog! You have truly outdone yourself Jessica and your Aunt should be flattered that she held her own against such a cake made with love! Rose, your comment made my day! Maybe week! Thanks for writing great books! Thanks Aunt Heather! I’m hoping to keep improving! This is exquisite. I know your Aunt was thrilled. Awesome cake!! I love how you piped the trellis and the chinese word! Really beautiful Jessica. And what a great photo of Aunt Peggy – be sure to give her a copy! Beautiful work!!! I love anything with detail.